SJ: You play a variety of different instruments including banjo, guitar, bass and dobro, correct? Do you consider one to be your main instrument? How/when did the dobro enter into the picture? KB: My first instrument was classical piano, which I played from age 12 to about 14. I started playing folk guitar at 16 after the required and ubiquitous exposure to camp counselors at Girl Scout camp. I pretty much taught myself the guitar, with one lesson on fingerpicking to get me going on the right hand. Figuring out chord progressions by ear and learning to transpose was a really great experience. Playing classical piano was I think fundamental in my understanding of time, and the folk guitar was great for establishing a basic understanding of chord progressions. Those two experiences provided the foundation for my later musical work. I started learning bluegrass banjo in 1976, eventually teaching banjo lessons full-time for a few years. During that time (early 1980s) I also returned to playing guitar, picked up the dobro, and learned bluegrass bass. I started transferring banjo licks to the dobro while I was teaching at Tiny Moore’s studio here in Sacramento (my first tune was “Pickaway”—a natural start for a banjo player). There was always a dobro or two hanging on the wall at Tiny’s, and during breaks between students I would pull one down and play banjo on it. I had a banjo student who attended a weekly jam. I asked if I could go along, he said no (he wanted to be the banjo player in the jam). When I asked if I could go as a dobro player, he said ok. That was really fun and perfect for me. It was kind of an intermediate-level jam, nothing too fast. So I got to play dobro in a comfortable environment and pretty soon there were people who didn’t even know I played banjo. 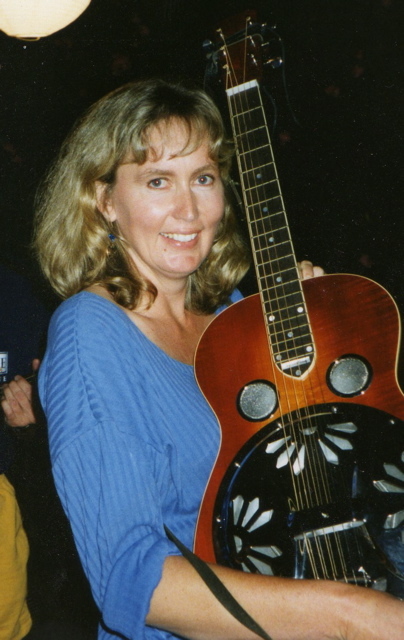 I became a “real” dobro player in the mid- to late1980s. I was in two bands during that time (The Bluegrass Philharmonic and The All Girl Boys) where I started out playing banjo. In both instances, I moved over to dobro in order to make room for someone else. In the Philharmonic, I started out doubling on banjo and dobro; Robert Bowden played mandolin. When Joe Craven moved to town, he became our mandolinist, Robert switched to banjo, and I became a full-time dobroist for the first time. With the AGB, we simply couldn’t find a female fiddler that was available at the time. Debby Cotter is not only a great banjo player, she’s also a great singer and songwriter. So again, I moved to dobro and by the time the mid-90s rolled around I hadn’t really played banjo for ten years (except at 3 in the morning at a bluegrass festival after enough Bushmills to override my usual good sense). I actually don’t even own a banjo anymore, which is a bit traumatic. At this point it’s hard to say which is my “main” instrument. In band and performance situations, I’m most often on dobro. But, at home and for fun it’s usually guitar. And underneath it all and in my head, I’m still a banjo player. SJ: How did you learn to play? Did you cop licks off of recordings, take lessons, etc…Were there any practice tools or techniques that you found particularly helpful? On the dobro, most of my practice time is spent playing along with CDs. Mostly Blue Highway. Or Jeff White’s two bluegrass CDs with Jerry on dobro. The Gibson Brothers with Junior Barber. This helps me warm up, and I find myself playing differently. When I hear something I like, I’ll stop the CD and figure out what’s going on. Or I find myself spontaneously copping a lick; then I need to stop and figure out what it is and why it works so that I can use in another context. Otherwise it’s gone. I’ll take an idea—or an approach—that I figure out this way, and try to focus on it for a while (during practice and performance) to see if I can integrate it into my playing. That takes quite a bit of focus. I can spend a whole evening trying to incorporate one new idea into my solos. I don’t typically try to learn licks note-for-note. More often I try to get the general shape of it and try to get the overall idea in a way that comes naturally to me, sort of put the idea through a “Kathy filter.” Those ideas are more likely to become part of my playing. SJ: How would you describe your style/approach as a player? Who are the players that influenced you when you were taking up the instrument? KB: My style is very simple. I think the essence of it is tone, phrasing and rhythm (of course, intonation is a fundamental here). I don’t spend as much time working on the dobro as I’d like to—and certainly not as much time as I should. I rely instead on playing notes that sound good and putting them in interesting places time-wise. I play lots of octaves, and sixths. The octaves give neat opportunities to play with time and slide around. One of the things I like best about the dobro is the texture it gives to the overall sound. I was really surprised when I first heard the AGB rough mixes on our CD. I really didn’t have much of an idea of what we sounded like until then. And the thing that struck me was the texture the dobro provided. Part of that was our producer, Jim Nunally. I was surprised at how far up in the mix he set the dobro chop. But I grew to like it, and since then have been more aggressive in playing rhythm almost right into the mic, where before I would have backed away. Also, I love the dobro for its rhythmic possibilities. I loving chopping rhythm and find all kinds of interesting things to do there. I do think it can be difficult for a dobro player in a bluegrass band to find space to play. You can roll like a banjo, chop like a mandolin, play sustained notes like a fiddle (ok, almost like a fiddle!) and rhythm like a guitar. You’re right there in the same sonic space as banjo and guitar… so sometimes it’s a little frustrating to find the right thing to do to add to what’s going on. Mountain Laurel banjoist Paul Siese is really good at providing me with some space. A good place to find that space is outside of bluegrass. I’ve lately been backing up local singer/songwriters, and that’s been really fun. I’ve also played recently with Sal Valentino (your older readers will recognize the name from the Beau Brummels and, later, Stoneground). Sal plays simple rhythm guitar and sings like the dickens. When it’s just the two of us, I have all the space in the world to back him up (or leave space), and his emotional vocal delivery inspires me. A funny thing though about Sal, he really messes with the melody. So my melody-focused approach can be really fun, as Sal and I switch roles—I play melody, he improvises around it. It’s neat. I find that technique is an interesting phenomenon. It’s generally very personal, everyone develops their own over time. Because I teach, I’m more aware of certain features of my own technique than I would be otherwise. I believe many of the fine points of someone’s technique comes from a biofeedback mechanism. You do stuff spontaneously, and if your ear likes the sound, that reinforces the technique and over time, voila! For instance, I have a habit of using rest strokes with my thumb. To do it, I push the thumbpick down into the guitar, and after pushing through the target string, the pick comes to rest on the next string. A string picked this way will be quite a bit louder than one picked the regular way. I don’t know if a lot of people do this; I’ve seen videos of me playing and it’s kind of striking, my hand actually kind of splays out (usually it’s kind of curled up over the cover plate. I’m guess that motion also brings more power into the thumbstroke. It looks pretty wasteful in terms of right-hand motion but it doesn’t seem to hold me back much. I do some pick blocking but not consistently; I generally do it when a ringing string is bugging me and I just want it to stop. A benefit of the rest stroke I just described is that it will stop the string the thumbpick comes to rest on. This benefits me a lot when I use a rest stroke when playing the 3rd string and then it comes to rest on the B string, stopping it from ringing. That’s usually the note that I’m conscious of not wanting to hear anymore. I never tried consciously to learn these techniques, but I think I developed them unconsciously. Lots of right-hand stuff develops this way. As a banjoist, I remember having lots of trouble getting my thumb up to the second string. When I look now at what my right hand is doing, the thumb is not only playing the second string, but also the first. There’s a different sound and emphasis when it goes up there, and who knows when it learned to do that! I have another habit of curling my left-hand index finger so that instead of laying across the bar, only the base and the tip of the finger touch it. I don’t know why I do this, and occasionally my finger will lay down into the groove. Who knows why, seems to work for me though. Another feature of my dobro style, and this might not always be the best thing on the dobro, is play what in banjo playing would be called “melodic” licks—where you might arrange a sequence of notes in a way that doesn’t require playing a single string twice in a row. So, a G scale would be, open 3rd string, 4th string 7th fret, open 2nd, 3rd string 5th fret, open 1st, 2nd string 5th fret , 1st string 4th fret, then 1st string 5th fret. You get a lot of open string ringing but as a former banjoist I’m as likely to play around frets 5 and 7 as I am to do hammer/pull-offs by the nut. I figured out Curtis Burch’s “Rainbow Bridge” for a student and was pleased to find at least one other player using these positions. At any rate, I’m so much better with my right hand than I am with my left, and this kind of approach lets me play to my strength. Final thought on technique and style, I’m somewhat known for my rhythm chops. I do them differently than most folks though; I use only my thumb, and do a backstroke with the back of the thumbpick. (No wonder my thumbpick’s always slipping!) More often than not, I’ll do this using the “universal chord” rather than fretting a chord. I find that’s pretty much my only opportunity to look up and around (and hope the photographer grabs a shot sans double-chin—sigh). I also don’t care much for the sound of a chop anywhere lower than the 4th fret and higher than 10. SJ: Do you write your own tunes? Can you give us any insights into how you approach arranging tunes for the dobro? KB: I hadn’t written many tunes until a few years ago. I found that a skill that’s very useful in improvisation—hearing similarities between tunes—was hampering me on the composing side. Everything sounded too much like something else to me. Then, a couple of years ago, I became obsessed with Ivan Rosenberg’s tunes on his “Back to the Pasture” CD. I had the opportunity to talk with Ivan at length about how he composed those tunes. He really inspired me, and I went right home and started writing some tunes. I lost the first one, because I started working on a B part before I recorded the A part, and lost it. I never got it back. But during that fall, I wrote five or six tunes I still haven’t recorded yet (except in my home studio). Ivan really helped me get over the barriers I had built against writing tunes. Arranging tunes for the dobro…first and foremost for me is finding the melody. I think chord first, then scale. The open scales are, to me, derived from the banjo (which explains why I’m only now learning scales other than G). For closed positions, I think, chord, plus “notes around the chord I can use”—which are, of course, scale notes. The other scale thing that I do is have a mental picture of the scale steps; that is, whole, whole, half, whole, whole, whole, half (for a major scale). A short cut way of thinking about this is to think, where are the half-steps? So where I end up at the end of a phrase or lick is in fact a particular point in the scale. So I can drop into using the scale wherever I end up. I’ll slide along using a scale till I get to a point where I want to play a roll in a closed position (say, where the melody stops for a few beats), so then I’d jump to that chord. A lot of this is by feel, using my ear, and from experience. I’m not the kind of improviser that hears something in my head and then goes to play it. I actually have the feeling a lot of times that I’m actually part of the audience. I hear it when they do; sometimes I like it and sometimes I don’t. My approach to the neck is rather mechanical, that is, I use certain rules (chord, scale, melody) to find things and work through the solo that way. It seems to me that whatever “creativity” I bring to a solo has more to do with phrasing and time than it does with melodic content. That part of creating a solo is very in the moment, and I’m often very surprised when I hear a recording of a solo performed live. In fact, I “learned” the second solo on “Powder Creek” from a recording of the AGB Strawberry performance in 1994. I had a lot of trouble figuring out something interesting for that solo, and when I heard the performance tape, I knew I had it. The solo is all about phrasing and time, and I think this is where my early classical training really benefits me. This points out something that I find interesting; that is, learning a solo from myself using this process is kind of like learning something from someone else, which is a completely different exercise than playing something spontaneously. Of course, in performance I wouldn’t play something that doesn’t come naturally to me, so learning from myself is easier than trying to figure out someone else’s solo from a CD. Still, it feels like a completely different kind of exercise than when I played it on stage. One interesting thing (to me, anyway) that’s happened to me lately: in my teaching, I am emphasizing scales for my students much more than I ever did when I was learning. I found that looking at scales was the only way I could compress decades of figuring stuff out by ear (the David Bromberg “one tune at a time” approach) into something useful for a student. I like to use scales as technique exercises, warm-ups, and as preparation to learn a tune. So, if we’re going to figure out a song, or try to improvise a melody (i.e., find it in real time), first we review the scale for the purpose of getting a visual idea of the pattern on the neck. This is to increase the odds of getting the right note—and more importantly, decrease the odds of hitting a clinker. SJ: There are so few women dobro players! Why is that? Do you have any general comments on women in bluegrass and/or the dobro? KB: Well, I don’t know. That question is routinely brought up in flatpicking circles (especially flatpick-l) and never results in an answer that seems to explain it. The lack of role models is pretty fundamental to the issue of women playing lead instruments. I think there are more women fiddlers because there are more women fiddlers. I didn’t play lead or go past the 5th fret on guitar until I saw Nina Gerber play with Kate Wolf. I don’t know why that is but I think we all build barriers in our minds to keep ourselves from possibly failing at something. I think that dobro is physically less demanding than flatpicking a guitar (at least it is for me). So it would be a natural for women. Still, the most important thing is to dig into the dobro and pull tone and volume out of it, so it’s still a physical challenge. There might be something about the competitive nature and raw power of bluegrass. Bluegrass is simultaneously a cooperative and a competitive endeavor so you could look at that either way. But my husband and I have talked about how there seems to be more women in old-time music (and I have noticed the same in Irish/Celtic circles). In those genres, the melodies are played as a group, and you aren’t put on the spot. I think you could think of them as more communal, and bluegrass as more individualistic. So I don’t know if this is the reason, but it’s interesting to think about. You also have to be pretty assertive to be a bluegrass player. (There’s a certain amount of a “who does she think she is” attitude that I’ve dealt with over time. Just something I had to get used to; and it’s certainly way less now than 20 years ago.) I guess a final thought is, there’s simply not enough time in life to do everything— especially if you’re raising children, an important and time-consuming job. I don’t think I could hold down a job, raise children, and spend enough time practicing to be a good musician. Two out of the three is hard enough! I think another good question would be, why don’t more guitar players also play dobro? At least in bluegrass circles, there are many many more guitar players than dobroists, and a lot of jams could use fewer guitars. Now I can understand that if you want to sing a lot you might want to stick to guitar (Andy Hall notwithstanding), but it just seems to me that you can make some awfully good music on the dobro if you learn how to make a good note. SJ: If I understand this correctly, you’ve been involved in bluegrass music for almost 30 years now; as a performer, band member, teacher, and also as a writer. What have been some of the highlights of those experiences for you? KB: Gee, has it really been that long? I had the very good fortune when I was first learning to be part of a bluegrass community that was not only supportive but full of really great players. In Sacramento, I hung out with John Green and Greg Townsend, both fabulous guitar players. My first band included Greg and mandolinist Stan Miller, both of whom went on to play in Laurie Lewis’s Grant Street String Band. I had played banjo for less than two years at that point, and the education I got from my bandmates was priceless. 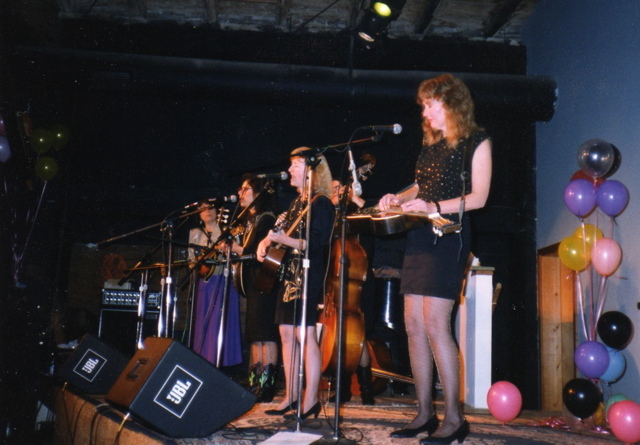 I played banjo (very briefly) in “The Barbelles”—a band put together for one gig, though we played several more. That band included Laurie Lewis, Kathy Kallick, Sally Van Meter, and Barbara Montoro (now Swan) on bass. That association brought me to a short period during which Sally left the Good Ol’ Persons. I filled in on banjo when they needed a fifth person. Playing with John Reischman and Paul Shelasky was incredible. You couldn’t play a cool lick without hearing it back moments later. And I was in way over my head. It was great, and I learned to dive in and trust that I’d be able to swim. Another highlight was my first gig on bass, which I learned to fill in those long summers when students quit their lessons. It was at the Freight & Salvage with High Country, and it was mandolinist Larry Hughes’ first gig as guitarist/singer for the band. Interesting night, but it went well. I played a lot of bass with High Country for a few years, when their regular bassist (Steve Pottier) wasn’t available. It was really fun. And, to this day, of all the instruments I play, I think I’m best at bluegrass bass (not the Missy Raines stuff, can’t do that!). I really enjoy the challenge of negotiating the time with the other players and deciding where to put the beat. A lot of people think bluegrass bass is easy, but that time thing makes it a real challenge, and fun, for me. I toured one summer (dobro and banjo) with Bill Grant & Delia Bell. That was fun. I kicked off almost all the songs, with Delia humming the tune for me so I could get it. Or she’d tell me, it’s just like some standard, and I’d just kick that one off and hear the song later. I had learned with the Good Ol’ Persons just to dive in to a kick-off. Kind of like diving off a cliff, not quite knowing where the water is. 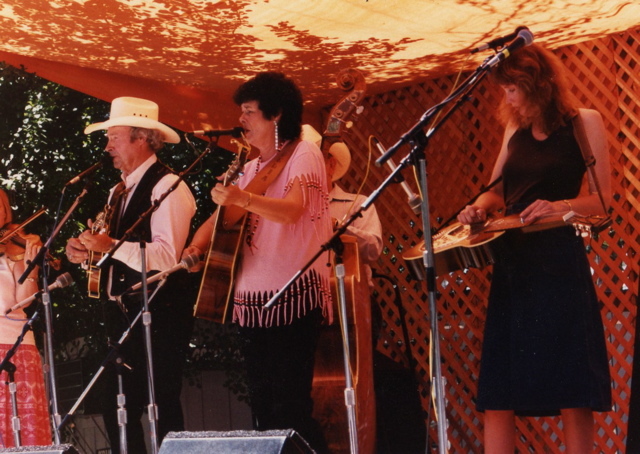 The All Girl Boys did a few tours, including showcasing at IBMA (1991). An Alaska tour was a highlight, as well as traveling to Vancouver BC. Playing the Strawberry festival was a real highlight. Making the AGB CD in 1994 was quite an experience, and I must say it changed how I hear things permanently. Maybe it was the 16-hour mastering session… Another really great experience was performing with Pete Grant at the “Loud and Clear: Resophonic Guitars and The Dopyera Brothers’ Legacy To American Music” exhibit at the Crocker Art Museum in Sacramento. Pete and I played as a duo, and they enjoyed it so much they asked us back for a second concert. This time we invited Steve Pottier to play bass, and Jim Beeler on guitar. We played both times in the ballroom at the Crocker mansion, and I was interviewed by the local NPR station. That always gets my work- mates’ attention, when they wake up to hearing me on the radio! And, I have to say how much I enjoy playing in my current bluegrass band, Mountain Laurel. We’ve done a number of great shows here in northern California—at the Palms, the Grass Valley Center for the Arts, and most recent but certainly not least, playing at the California Bluegrass Association’s annual Father’s Day Festival. I’m also enjoying a renewed interest in teaching and mentoring. When I turned 50 (two years ago) I decided that I better get a-goin’—time’s a-wastin’! So I’m trying to play as much, teach as much, record as much, as I can. I am very much enjoying my current work as a regular columnist for Flatpicking Guitar Magazine. Because I don’t get out much as a guitarist, it’s been a great opportunity for me to get some exposure as a guitarist and instructor. And I told you about the California Bluegrass Association Music Camp, where I taught beginning dobro, just this last June. I really enjoyed that and hope to return next year. SJ: Tell us about Mountain Laurel (and other past projects such as the All Girl Boys)…How have the musical demands of the different projects you have been involved with challenged you as a player or helped you to grow as a musician? Are there any relationships with other musicians that have had an especially big impact on your own development as a musician? KB: I started my performing career with people who were much better musicians and much more experienced than I was. I learned quickly to “get ‘er done.” No room for dilly- dallying around, being scared (though I was terrified), or playing wimpy. I was extremely fortunate to be invited into that circle and treated as an equal, and it was a challenge to me to step up to the plate. I have also been very lucky to play with great singers. I learned early on that I was an instrumentalist, not a singer. So I am always trying to sidle up to good singers. For me, hooking up with good singers is where it’s at. In both The All Girl Boys and Mountain Laurel, good singing was and is the primary focus. Specific musicians, I’d have to say my musical relationship with Mary Gibbons has had perhaps the biggest effect on how I approach music, and, especially, performing. Mary is not only a great singer, songwriter, and rhythm guitarist, she also has a keen ear for what works and what doesn’t. Perhaps most importantly, she has very high standards for her music. I learned from Mary to bring my best to the table and leave the not-best at home. SJ: Tell us about your instruments: what kind of dobros do you play? What does your live performance rig consist of? Can you offer any general advice about things to consider when shopping for a resonator guitar? The Scheerhorn, and then the Allen, changed my playing significantly. Modern dobros give their sound up much faster than the old ones, and I think the responsiveness translates into better playing, kind of a bio-feedback thing. When I was first playing Sally’s Scheerhorn, High Country dobroist Jim Mintun looked at me and said, “you play different now.” It was the guitar, and it did indeed change my playing. I eventually sold that Scheerhorn to Ivan Rosenberg, who subsequently sold it to Janet Beazley. I’d love to have it back, but I think she’s keeping it! I now play the Allen almost exclusively. I recently acquired a new Scheerhorn L-body but the Allen is still my main guitar, dobro-wise. It’s really great to have a locally-built guitar (Mountain Laurel has three locally-built instruments!). I can get it set up pretty much any time. Plus, I’ve dropped it three times and it’s a hoss. A little beat-up at this point (that last drop was a doozy) but as clumsy as I am, I’m kind of afraid to take the Scheerhorn out of the house. I plan to put the S.—which by the way is a fabulous guitar—into D tuning and explore that for awhile. Though both of my dobros have pickups (a Schertler on the Scheerhorn, and a McIntyre on the Allen), I almost always use a mic in live performances, for two reasons. First, I’m used to it, and especially in the bluegrass band setting, I’m accustomed to mixing my own sound via using the mic. I’m currently using an AKG C1000 my husband bought me for recording. It turns out to be a great performance mic as well. The other reason is that I’m not a gearhead. This may be partly a gender thing, but I’m being dragged kicking and screaming into electronics (I’m using a pick-up on my guitar now). I have a pre-amp, and a volume pedal, but I’d still rather just use a mic if I can get away with it. I do use the pickup when sitting in with some young friends with drums; however, next time I do that I’m going to take the lap steel (I have a Vega New Yorker and an Oahu Diana from the 1930s, but I haven’t messed around with them much). I’m not sure what advice I can give about dobro shopping—especially not being a gearhead. For lower-end guitars (and there’s some really good ones out there), I’d just say, make sure the bridge is high enough. Seems like a lot of them come with a lower bridge, which makes it hard to keep your fingerpicks from hitting the cover plate. Or maybe it’s a different shape of cover plate, I’m not sure. My own experience with instrument shopping is generally that I buy the one that facilitates my playing. It’s a feel thing. It’s really hard to shop for dobros though. We rarely get the opportunity to play them first, and especially to compare side-by-side. I have had the opportunity to play a couple of Gold Tones, and I think they’re a mighty fine choice for a first dobro. I use Tipton bars, the old-style Dunlop fingerpicks, and a Beard capo. I was complaining to a friend, Jonathan Schiele, about not being able to get the 4-hole Dunlops anymore (the new Dunlops, with the extra holes on the top of the wrap, really tear up my cuticles). He went on eBay and found me a whole brand-new tube of the old ones! So now I’m set for life. I’m now using the Zookie thumbpicks (thanks resoguit guys!). I do have difficulty with picks slipping (especially on those rest strokes), and getting thumbpicks that are small enough (for a big gal I’ve got really skinny fingers!). So that’s an ongoing issue for me. Oh, and I use GHS 1650 strings. Turns out the .28 G string is really important to me. I got my first Tipton bar from Ron himself, at IBMA in Owensboro (1991). Unfortunately, I loaned my original Tipton bar to a student who moved away and never gave it back (grrrr). The new ones are still good, but they’ve moved a little more toward the Scheerhorn bar shape (more slope on the shoulders). I’d sure like to get that old one back! I like the Beard capo but in fact I’m trying to use a capo as little as possible. About the only times I use one anymore are for fiddle tunes in A and sometimes D, folky tunes in E or F where I want to use the open D scale, which I think has a great sound for folk, or bluesy things in F or G where I want to use the open E stuff. SJ: What kinds of things interest you or motivate you to learn new material on the dobro? Do you have any closing comments for our readers? KB: Mostly, it’s band- or performance-driven. I need to learn something for a gig. Otherwise, the guitar actually takes up a lot of my practice time. This is kind of backwards, since dobro takes up most of my performance time. But, and maybe it’s because I’m a bit complacent on the dobro, the guitar is for me so difficult that I really have to practice it a lot if I’m to play it at all. I also have a recently-acquired interest in Irish music, which I mostly prefer to play on guitar, though there are a few tunes (Shebeg & Shemore, Far Away, Star of the County Down) that really sound great on dobro. Mostly, I’m leaving the Irish dobro slot to Pete Grant! Occasionally a tune will really grab me and I’ll learn it on a bunch of instruments to see where it sounds the best, or I’m just curious to how it would lay out on this other instrument. “Powder Creek” is a tune I’ve played on banjo, guitar, dobro, and even a little on mandolin. It’s fun to see where different instruments take you on a tune. Here’s the coolest thing about the dobro for me: it fits into all kinds of music. Phrasing, timing, rhythm…. it’s a great instrument for in-the-moment expression. For me, the dobro kind of floats on top of things, so you’re free to phrase things in the moment. Recently I had the wonderful opportunity to sit across from Orville Johnson and pick a few. It made me realize how much I have not been able to sit down with someone on dobro and trade licks, like I do on guitar—though it was hard backing Orville up and trying to check out what he was doing at the same time. I guess dobro players are still few and far between. I’m also inspired by Andy Hall. While folks like Jerry and Rob are incredibly fantastic, I am so beneath them that mostly I don’t get it. Or perhaps we just think in different ways. Andy on the other hand is incredibly fantastic but in a way that I can understand. So I’m really liking his playing, and because I do understand (most of) it conceptually, I can actually take something away from what he’s doing. It’s also humbling, because I can hear how much better I could be if I put more time into it. Which brings me to a final thought, about focus. I have chosen to split up my very limited time between several instruments. (I’m lucky to have a good job but it sure takes me away from the music.) Notice though that in the beginning of my musical career I was a serial instrumentalist—focusing for several years on one thing. At this point in my life I’m pretty frustrated by the lack of time I have to keep everything practiced up, do some composing, do some recording, teach more, write columns for Flatpicking Guitar Magazine, garden. I love dinking around on the mandolin. But it seems like every minute I spend on one thing is a minute not spent on all the others. It’s pretty frustrating. I think there are costs and benefits associated with being a multi-instrumentalist. I’m ok with it at this point with it but it’s a constant struggle. Not to mention balancing the music with the day job. And family. My husband, Jon Hartley Fox, a writer in the music business, is incredibly supportive of my second career, so that helps a lot. There are benefits from being a multi-instrumentalist, but sometimes I wonder where I might be if I’d stuck with one thing. Who knows?